I’m not sure how it happened. I might be a little crazy for agreeing to the outing. Working on three hours of sleep here, sooo…. My neighbors are great. I don’t know many people around here who can say they know and regularly talk to many of the people who share the same street name in their snail mail address. I’m working on three hours of sleep here. Forgive my ramblings. Back to the story. L, P, C, and I went to the midnight showing of Breaking Dawn Part 1 last year. Of course, we’d go to the last installment November 15-16. L bought our tickets online for the 12:01 showing. A character walks down the street and meets up with her peeps as she goes. They join her just as she arrives at their locations. It happened just like that. I walked down a few houses and met up with P and C. Then M (one of the several teens who joined us) walked out and met up with me. Then L and her daughter S with one of her friends in tow. Seven crazy females piled into L’s SUV (yep, she bought the tickets and drove–instigator and enabler), and her teenage son and his friend followed in his car. Yes, I did indeed just say “teenage son and his friend.” They joined us at the movie theater. Their sole purpose for tagging along was to talk to girls at the theater. They didn’t even sit with us when we got there. The nerve. 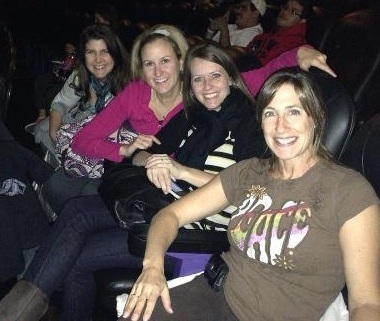 They went into the theater that was full of girls rather than sit with us in the half-full theater. Then we sat and talked and looked at Facebook in the dark for an hour and a half. At midnight, we were ready for the movie to start. Some of us (not me) did the potty dance and excused themselves with 20 minutes of movie trailers to avoid. A couple walked in and sat down in front of us. C and I looked at each other. She said, “Seriously, they just walk in at midnight and find a seat?” Who knew that we didn’t have to get there with enough time to check into security be able to find a decent seat this year? Last year, we were way early and had to sit in the fourth row. Waaaay too close. No spoilers from me today, I promise, because I get to go see it again with my BFF. I will say that it was the best of the five movies! Something happens at the end and had the entire theater screaming and cheering and freaking out–a twist none of us saw coming. There were grown men, who most likely didn’t read the book, who cheered and gasped and freaked out with the rest of us. It was a scene that might not have read well in the book had it been written but was perfect for the movie. Wow! That’s all I say about that for fear of letting something slip. I don’t need the Spoiler Volturi tracking me down for breaking that rule. 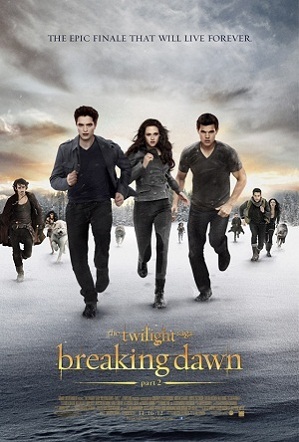 If you want to read in-depth descriptions of all the characters, you must read Debra Kristi’s blog: Twilight Saga’s Breaking Dawn Breakdown: Immortal Monday.